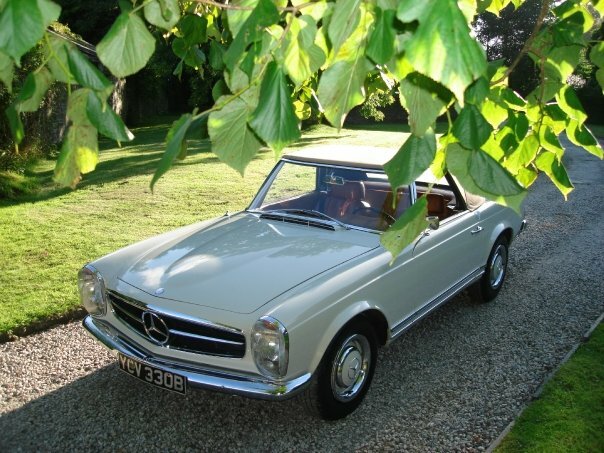 This is a superb car finished in white grey, and camel brow interior with a beige soft top. All models were equipped with an inline-six cylinder engine with multi-port fuel injection. The bonnet, trunk lid, door skins and tonneau cover were made of aluminum to reduce weight. The comparatively short and wide chassis, combined with an excellent suspension, powerful brakes and radial tires gave the W 113 superb handling for its time. The styling of the front, with its characteristic upright Bosch “fishbowl” headlights and simple chrome grille, dominated by the large three-pointed star in the nose panel, paid homage to the then already legendary 300 SL roadster. This pagoda was imported from Belgium in 1998 and underwent a full restoration including a complete nut and bolt engine overhaul, and newly trimmed interior including new soft top. It’s a really lovely example of one of the earliest 230SL. It’s not a show piece, but a very usable car that gains value every single day and manages to put a great smile on people faces. It comes with a full M.O.T. plus the added plus of being tax exempt.This Mercedes has to be seen as the condition is outstanding, any Inspection Invited., Please call or email to arrange an appointment to view this vehicle.